Art Lessons. Projects. Hands On Activities. I love history. I love art. I teach both. I have gathered art lessons and projects for you to use with your students. These hands on activities are great for a variety of learning styles. These are lessons were chosen to encourage a quality end product without sacrificing individual creativity and capabilities. using chalk pastels create your ground cover since we are doing a tiger its going to be orange. This is where we deviated from the book. You could draw directly on the beautiful background you created. 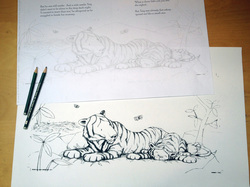 We pulled up this image of how to draw a tiger and practiced for a bit. Greens, browns and grays create tall grass that your tiger is stalking through. DO NOT add TOO much GRASS! You don't want to cover your tiger up TOO MUCH! This project was inspired by this book. Its been a wonderful reference for us! Highly recommended. 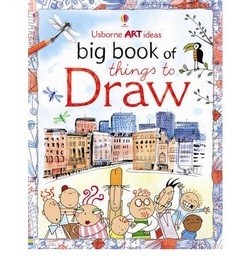 *we don't know any Usborne distributors right now - if you are one and would like us to link to your site - let us know!